G.I. Joe Classic Vol. 19 TPB Review – AiPT! In the latest TPB from IDW, the G.I. Joes face threats from all sides. Hidden desert nukes? Got em. Giant skull-shaped jets? There’s one of those. Cyborg ninjas? Boat loads. Weather dominators? Th…nah, man. What? That was the cartoon. Keep up. Though it’s a bit disingenuous to call these issues ‘classic’ (the collected issues were first printed in 2012), the latest G.I. Joe trade from IDW follows the convention established in previous iterations–and that’s sort of a mixed bag. These compilations usually bring together a decent number of issues (nine in this latest edition) yet only from the “A Real American Hero” series–meaning some of the storylines are incomplete due to crossovers with the publisher’s Cobra and Snake Eyes series, among others. To the credit of the editors tasked with putting together this trade, most of the storylines explored in the book are suitably contained to give readers a more cohesive experience. Interestingly enough, this collection of issues (which is sequential, not thematically chosen) manages to relegate series mainstay Snake Eyes to a minor supporting role. I know that might not mean much to some, but it is a bit like reading an X-Men trade that doesn’t have Wolverine. Hama does manage to give shine to a lot of his other favorites (Chuckles and especially Jynx get a lot of love), but that he benched the MVP for this long of a stretch is actually a bit of a welcome change. 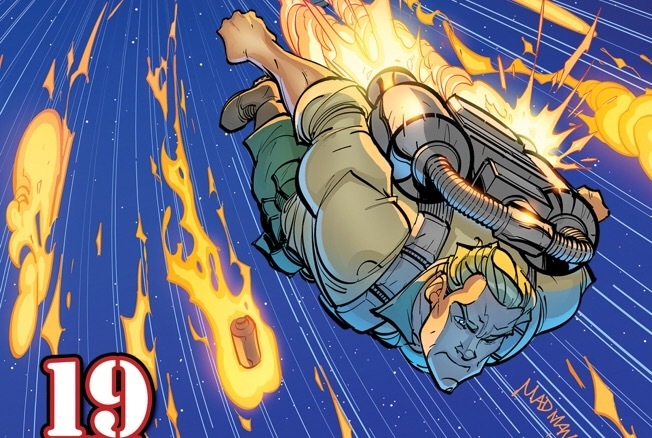 Our first arc follows a complex retrieval mission to both rescue some captured Joes and, somewhat coincidentally, prevent a nuclear explosion centered on the prison that is holding them. This arc is not a bad place to start, as there’s suitable action well rendered by Ron Wagner (and to a sadly lesser degree by series regular S.L. Gallant), high stakes and an interesting mix of characters that should be familiar to fans of the cartoon/toy fans who may not have followed the comics as closely. The second series sees Scarlet lead an effort to rescue a political hostage from some non-Somali pirates. Unfortunately, as these things tend to do in the G.I. Joe world, the pirates are actually working with a highly organized and well-equipped terrorist militia of no distinct nationality led by a costumed weirdo with a flare for the dramatic. This dimestore clone of Cobra Commander, and seeming M. Bison cosplayer, is the Black Major and he spends so much time chewing the scenery that the maybe eight Joes manage to kill the at least 80 red-suited henchmen he brought with him and down his crazy skull-shaped plane. This is without a doubt, the weakest sequence of the book, so I may spend some time dwelling on it, if for no other reason than Gallant’s artwork seems at its laziest during this stretch. Nowhere is this more evident than in the faces of the non-Joe characters on the boat. Dr. Burkheart’s face looks fundamentally different every couple of pages, and the Black Major at times looks like Modern Family’s Ty Burrell or (perhaps intentionally given his costume) Raul Julia in Street Fighter. Hama doesn’t do much to save the book either. There’s a half-assed attempt to humanize the leader of the pirates at one point, that is just so undercooked that its inclusion feels cheap. Add that up with the curious decision to send these weird “diet-Cobra” goons at our heroes and you come away with a section that was entirely skippable. Fortunately the next sequence, in which Lady Jaye and a covert surveillance team take down a South American warlord, is the best. It’s particularly high on action and though it does have some issues (notably the John Wick-like ability to murder a room of 50 people and emerge unscathed possessed by Chuckles and Jynx) it’s an interesting take, and the villains are suitably menacing. I should also have issue with the fact that Lady Jaye is tortured for an untold amount of time and then repeatedly kicked in the face for what must be at least 10 minutes, only to then get up and single handedly take down three dudes with her bare hands….but it is a G.I. Joe comic, what do I expect? After a brief one-off issue where Scarlet and Snake Eyes in an old man mask (for some reason) go camping and bond with wolves, the final arc follows a long circuitous plan set forth by Cobra Commander to create sentient cobra murder robots and an international incident to discredit the Joes with them. This sequence has a lot to like, but also a lot to nitpick. Seeing Cobra Commander’s forces manage to successfully ensnare almost the entire G.I. Joe team is great. CC’s got a reputation for being something of a dramatic failure, so seeing a plan go off without a hitch for him is almost nice. That being said, they clearly didn’t put a lot of thought into the character of Pale Peony beside “cute white girl ninja,” and she’s just not that interesting because of it. The fact that Jynx uses her full name every time she speaks to her also feels forced and unnatural. Also she calls the leader of the Arashikage by the wrong honorific (san instead of Sama), which is just something that bugs me as someone who studied Japanese. While the stakes are reasonably high in each these segments (Lieutenant Falcon literally leads a recon team into a facility expected to go up in a mushroom cloud minutes later), one problem with Hama’s tenure with IDW (as opposed to his much prefered run with the series when it was a Marvel property) is that he seems unwilling or unable to kill off any of his named characters. With such an expansive cast of named characters, that the only casualties seem to be redshirts (or blue shirts depending on the rank of the cobra baddies that die) feels like a weak decision and leaves many of the sequences feeling sheltered from the genuine risks of combat. Yes, throughout the trade characters like Falcon, Gung Ho and especially Lady Jaye sustain some sort of injury in the course of battle, but they’re all perfectly fine moments later and show no lasting sign of injury. You can also get down on Hama for hewing to a pretty familiar script for a lot of these stories. I don’t even mean how similarly the arcs tend to be paced (they do all seem to follow the same operatic “build – tragedy – overcome” formula); I mean the literal word choice tends to be a little repetitive. In bemoaning the flowery mannerisms of Baron Bludd, sniper Lowlight says at least three times that he should pop the mercenary for “murdering iambic pentameter,” which was clever at first and less clever each additional time you hear it. Like the Bee Sharps. I also attempted to count how many times a character mentions that some decision is “above their pay grade” but gave up at five. I should also mention that the actual layout of the word bubbles can be confusing at times. Reading from left to right and top to bottom as I and most of the western world are wont to do will lead to some awkward sequences where the response comes before the question. Still despite its faults, the trade is worth picking up for G.I. Joe fans. It’s heavy on action and has a few great character moments. More casual fans won’t have too hard of a time getting into the story, but may have a hard time keeping track of all of the characters. They’ll also probably be upset that the book ends on a crazy cliffhanger right as it’s getting the most interesting, but hey–maybe that’ll bring them back for trade #20.